A building of national significance was destroyed and a powerful minority party blamed the event on terrorists. The centralized media withheld vital information and political and military power was swiftly consolidated. Laws were hurriedly passed that allowed the government extraordinary powers, including the arrest of citizens previously protected by the constitution. Discrimination against Jews and gays was a core value held by those who illegally seized state power. Are we discussing the rise of fascism in Germany or America? In Boulder Dinner Theatre's production of Cabaret, the setting is clearly the Kit Kat Club at the end of the Weimar Republic in Germany as the Nazi's were taking over, but for anyone willing to look outside the corporate-controlled press in the United States the parallels to our present situation are too close for comfort (Anyone doubting the connection between the Bush family and Nazi values, click here). In our current political season, the future of democracy—itself teetering on the brink of total control by moneyed interests—is at stake. Yet, in the wake of 9-11, those willing to point out the true nature of the empire's new clothes are vilified for "unpatriotic behavior" by the goose-stepping ditto-heads seeking to institutionalize "right thinking." In the absence of any critical analysis by the so-called "major news organizations," the general populace was browbeaten into believing the junta's version of events and yoked to the corporate buckboard for an unending war on terrorism. Public sector economic spending was further syphoned out of social programs and into the pockets of military-industrial contractors who financially support the junta's campaign to elevate corporate rights over personal rights. As the nation entered into, uncharacteristically, a recession as it went to war, discretionary spending for arts organizations dried up, forcing entertainers to choose safe, uncritical fare in an attempt to draw audiences looking for reassurance that everything was going to be okay. Within the past year, however, incriminating information, however limited by censorship, concerning the strategy and behavior of the Bush cabal, has begun to make its way into the public arena, creating a potential window of opportunity for soul-searching and critical analysis. Nevertheless, it is still remarkable that a local dinner theatre would undertake such bold and uncompromisingly honest project such as Cabaret. There have been a couple of excellent productions in recent memory of this dark, edgy story, but Boulder Dinner Theatre's new artistic director Michael J. Duran has set a new standard for creativity, intensity, and relevance. A veteran of New York, London, and various national tours, Duran plumbs the depth of every scene with uncanny insight and master's sense of irony. Take, for example, the scene in which the landlady, Frauline Schneider, and her tenant, lady of the night Fraulein Kost, meet in the hall, fresh from their trysts. Here, Duran and costume designer Linda Morken draw attention to what had always been a morally ambiguous moment—by giving the women similar dressing gowns—forcing us to confront the parallel nature of each woman's need, and the implications of such thoughts on the way we perceive those different from ourselves. But, literally, all the key moments in the story, ethical, political, or personal, are played to well-crafted perfection. The tenderest moments are those between Wayne Kennedy, as Herr Schultz, and Barb Reeves Kuepper (Frauline Schneider), as they make time stand still during their touching courtship and peerless, heartfelt singing. 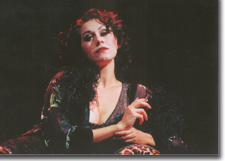 Alicia Dunfee, as Sally Bowles, overcomes playing against type, finally winning us over as the seductive, high-strung, broken-down, alcohol and drug-laden chanteuse. Dunfee's smoky voice and bluesy manner, particularly in "Maybe This Time," would certainly draw us back to the basement dive where she fronts for the jazzy six- to nine-piece orchestra. John Scott Clough, returning to BDT after 25 years, gives a sparkling performance as the idealistic and earnest American writer, Bradshaw. 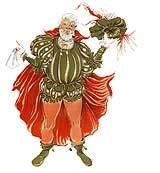 But Brian Mallgrave, in the centerpiece role of the Emcee, is the show stopper. Looking at times like Joel Gray, who won a Tony in this role for the original Broadway production (1966), Mallgrave slithers and prances through a host of evocative and naughty numbers, each one outdoing the next, until the institutional bigotry and racism of the fascist regime begins to poison his libertine soul. Here, Mallgrave's Emcee, like Dunfee's Bowles, expresses incredible vulnerability and frailty as his world collapses, ending in the concentration camps, bearing a Star of David and a pink triangle patch on his chest. Other standout featured performances include Bren. Eyestone Burron's bawdy Fraulein Kost and A.K. Klimpke's slippery Nazi agent, Ernst Ludwig. Surrounding all these stellar turns is the Kit Kat Club itself, with its lovely boys and girls, there to attend to your every pleasure and fantasy (ADULT CONTENT should be noted). Doing his utmost to give his dinner guests a tantalizing experience, director Duran regularly serves up small, but tasty morsels of burlesque as only a top-notch song and dance team can swing it. In addition to Duran's clarity of vision, Boulder Dinner Theatre's entire ensemble exemplifies the degree of excellence that is possible possible when a group of unusually talented actors-singers-dancers work together for years. On top of this, they've shown a great deal of courage in fully realizing the potential of this work at a time when the parallel forces of materialism and fascism are once again controlling the agenda. 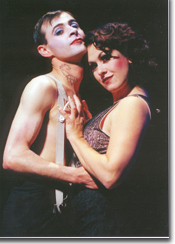 Cabaret runs through November 7th. For tickets, call 303-449-6000 or order on-line at www.theatreinboulder.com.